First King Salmon of 2014! 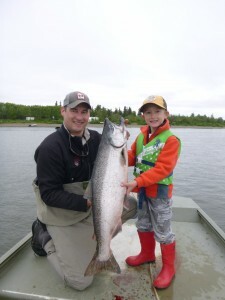 The first King Salmon of the 2014 Crystal Creek Lodge season was caught today at the Nushagak River by William Oberholtzer, age 6. Guiding him was his dad, Alex Oberholtzer, pilot/guide and partner at Crystal Creek Lodge. The Nushagak run of Kings is ahead of schedule and the run is predicted to be strong! Kings are also in the Naknek. Our first guests go tomorrow to the Nushagak.